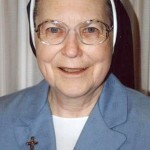 Born on Valentine’s Day, Sister Mary Madelena Pohlman was known for the character of her heart and gentle disposition expressed in her love of nature, care of the poor, and dedication to the community. The oldest of seven children born to Raymond and Alice (Lammers) Pohlman, Mary Lou was raised in Delphos, Ohio, where she attended St. John the Evangelist elementary school before becoming an aspirant at Notre Dame Academy, Toledo, and entering the Sisters of Notre Dame in February 1956. At her Investment she received the name Sister Mary Madelena. 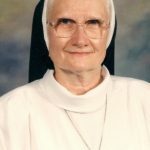 Sister was missioned to the Motherhouse in Rome; for her Tertiate, her Perpetual Profession of Vows in 1963, and as an Adoration Sister in 1967-68. Sister received her education in biology and theology at Notre Dame College of Ohio, University of Dayton, and Xavier University in Cincinnati. 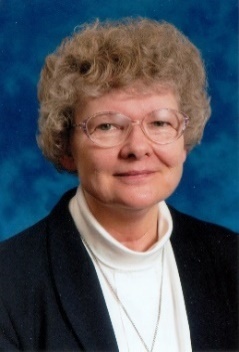 Sister was an excellent teacher, teaching 34 years on both the elementary and secondary levels in the Toledo Diocese. Sister served in Pastoral Ministry at the various parishes in east Toledo. In 1999, she was able to devote full time to this ministry – a ministry she termed was most like Jesus’ ministry. She led many RCIA programs, visited the sick, helped with liturgies and sacramental programs, and taught in adult education programs. 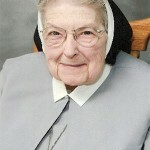 She took communion to the hospitalized and was the catalyst behind many ecumenical activities in the eastside parishes. 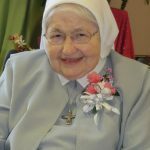 Throughout her life Sister kept abreast of social justice issues giving her heart for social justice causes and ministering to those in need. Growing up during the Depression gave her a heightened sense of awareness for others and the need to act on behalf of justice. Living on a farm, she worked in the migrant camps where she saw firsthand the struggles of the poor. Her deep concern for the poor never left her. It found expression in such avenues as the Sisters of Notre Dame Peace and Justice (JPIC) Committee. Her intimacy with her Beloved gave her strength to endure her days of illness and suffering from cancer. Intense as she was about everything, she was even more intense in her relationship with God. Her deep convictions, her faith life, her trust in God, and her love for Notre Dame, carried her through the suffering that led to her entrance into eternal life at 80 years of age in her 61st year of religious profession. May she rest in the peace of Her Beloved.